Vanity Despair: Arriving isn't what it used to be. 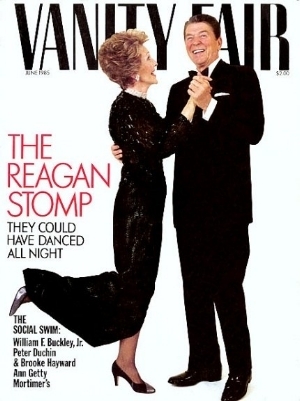 Vanity Fair used to be how Elite Liberal Establishment's glamorous faction let the world know that they had arrived. You arrived, and were even making numerous encores. Glamor wasn't just a Hollywood, thing, either. It was part and parcel of the American Dream. It was all very flattering. Political actors got their cover, and everything was stylish. Tina Brown and Graydon Carter got it, even though the former was British, and the latter from Canada. It wasn't as if there wasn't hard-hitting or interesting articles. There were plenty in its heyday. The narrative was still about arriving and delivering beautifully. One of the best accounts of the Stephen Glass scandal came from Vanity Fair. You had Dominick Dunne cover crime stories -- and his own soul knew what it truly meant. Once upon a time, it understand its function very clearly. Ans Vanity Fair is feeling it with more than just the cutbacks, new paywall, and reduced frequency, from 12 issues a year to 10. Even the new covers look more like dated and unremarkable passport photos than art that tells a story. And that hints there is no more arriving because no one knows where to go. There are no icons. Just random people wandering about here and there. And that describes what happened to journalism: there is no place they can now go. No one can arrive because they have nothing to deliver, and with those blinders, their filters impose a silent narrative on those on the cover as well.